A rookie year for the ages, Ezekiel Elliott is not simply the best first-year running back in recent memory. The dynamic back has already put his name in as arguably the best RB in the entire league and his collecting and fan interest has exploded. 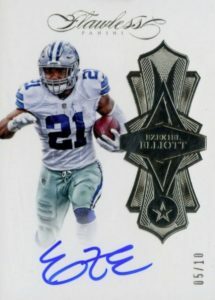 The list below details the top Ezekiel Elliott rookie cards to collect now, including notable autographs and his pre-rookie cards. 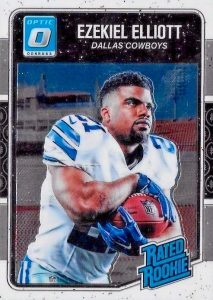 Paired with his teammate and fellow 2016 rookie, quarterback Dak Prescott, who has his own popular rookie cards, Ezekiel Elliott has proven that his impressive college career at Ohio State was just the start of something special for America's Team. Although he clearly benefits from the elite offensive line of the Dallas Cowboys, his success has seemingly proven that the team knew exactly what it was doing when it selected him fourth overall in the 2016 NFL Draft. 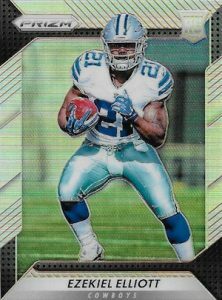 Shop for Ezekiel Elliott rookie cards on eBay. 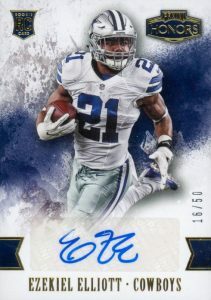 Collectors have plenty of Ezekiel Elliott rookie cards to obtain and the majority of his 2016 cards come from Panini, which holds the exclusive on both licensed NFL and college cards. Without question, the brands under the Panini umbrella are home to the very best rookies for Zeke. Another option is Leaf which showcases early Elliott cards using an airbrushed and generic look, but still offers low print runs and on-card signatures. 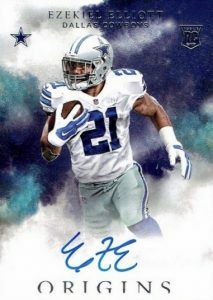 The list below highlights key Ezekiel Elliott football cards issued during 2016 as well as an early pre-rookie option. Click on the images or listings to shop for cards on eBay. Linked sets in the descriptions go directly to detailed product profiles. 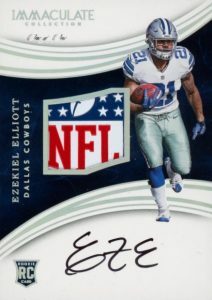 Sporting a trio of relics and a sticker signature, 2016 Panini Absolute is the first of several Ezekiel Elliott rookie cards originally issued as a redemption. Included in the Rookie Premiere Materials subset, the Spectrum parallel (#/10) is shown below. 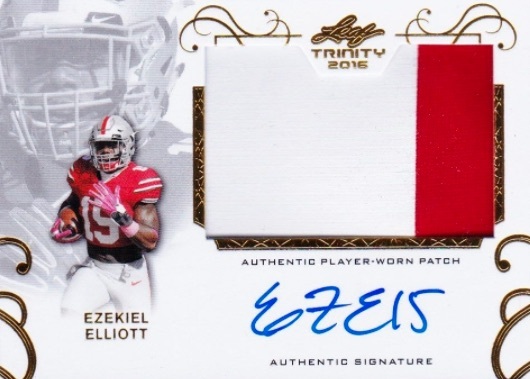 A common theme for Ezekiel Elliott rookie cards, 2016 Certified is one of several to feature a moderate relic swatch and sticker autograph. The base version, numbered to 149, originally came as a redemption. 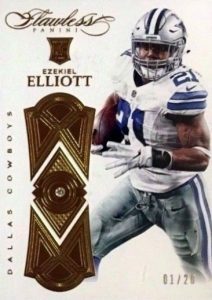 While it could have been a sleeper value pick with a normal base print run, the 2016 Clear Vision rookie for Ezekiel Elliott is actually part of Level 3 which puts its rarity at just 99 main copies. Still, the acetate look is appealing and the various parallels bring the total amount close to 400 copies. 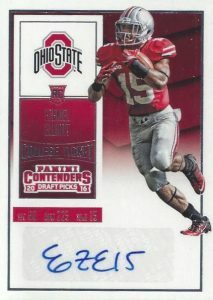 Likely to be among the most popular Ezekiel Elliott rookie cards going forward, collectors have to wait on these highly-anticipated redemptions in 2016 Contenders. Both featuring on-card autographs, the base has a vertical orientation while the variation works with a horizontal design. 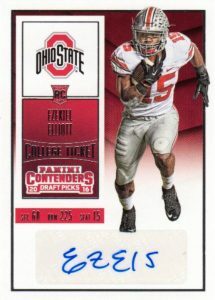 One of the earliest Zeke cards of the 2016 hobby year, 2016 Contenders Draft Picks takes the popular Ticket subset and applies a college theme. In addition to the main version with a white jersey, a short print variation presents Elliott in a red jersey. Even with the odd layout, the Pen Pals insert for Elliott in 2016 Donruss Elite is notable as one of the earliest on-card signatures for the young stud. The main edition is signed in blue ink while red ink and green ink autographs are more rare. He also signed a triple version with Derrick Henry and Kenyan Drake. 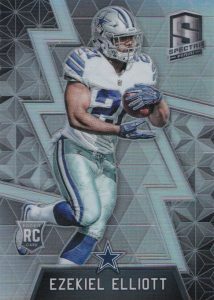 A popular low-end choice for Ezekiel Elliott rookie collectors, 2016 Donruss Optic applies chromium to the Rated Rookie design. In addition to many Refractor-like parallels, collectors can find a signed version, issued as a redemption, and a Rookie Patch Autograph insert. 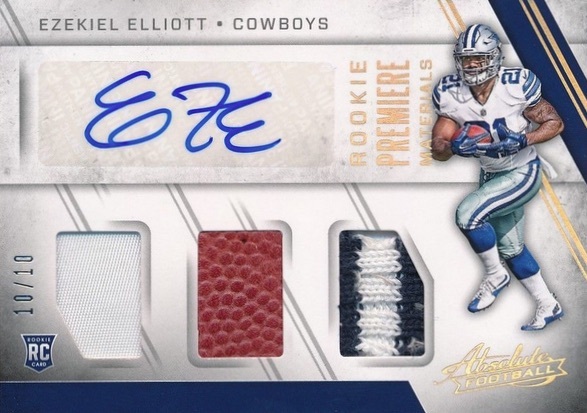 Elliott also has a standard insert included in The Rookies. Although not numbered like most of the other EZE rookie autographs, the 2016 Donruss Signature Series card still appears fairly rare. When they do show up, it's hard to miss thanks to the foil that covers much of card. 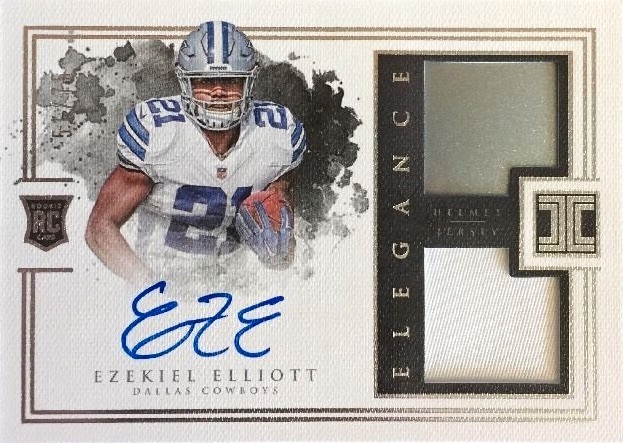 The highest of high-end, the 2016 Panini Flawless Ezekiel Elliott rookie card rolls with an actual diamond in the main version and offers Ruby, Sapphire and Emerald parallels with even lower print runs. He also several signed inserts in the premium set. 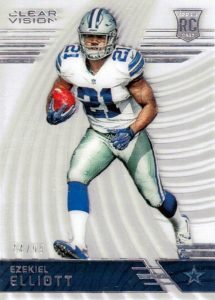 Nearly impossible to find with just eight copies in existence, the 2016 Panini Gala card for Elliott is still worth noting considering it is his rarest rookie by a wide margin. While much of the product is composed of buybacks from earlier Panini sets, 2016 Honors does have a limited base and rookie offering of its own. 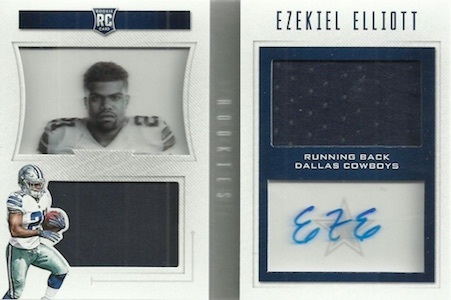 This encased Ezekiel Elliott card has a sticker autograph and a main print of 99 with a few parallels of lower amounts. Available in both college and pro versions, the NFL version of 2016 Immaculate is the preferred choice for many. Elliott is part of the RPA subset that is limited to 99 copies. While the base was issued as a redemption, low-numbered parallels are already live. 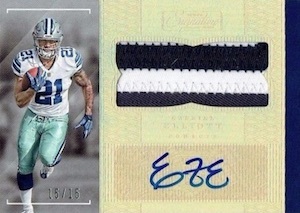 Like many of these high-end sets, there are other auto-patch cards for Elliott, like the one on the right, that look very similar. Immaculate also has some insane relic cards. 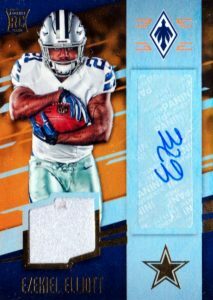 Although there are several different signed cards for Ezekiel Elliott in 2016 Immaculate Collection Collegiate, all are low-numbered issues and include hard-signed autographs. College-based cards will be more of a niche offering, especially as his NFL cards build in number, but the high-end aspect and rarity gives Immaculate Collection Collegiate long-term appeal. Plus, they are a top option for fans of the Ohio State University Buckeyes. A standout among 2016 debut brands, 2016 Impeccable utilizes an Elegance subset with a helmet-jersey memorabilia pairing and on-card signature. 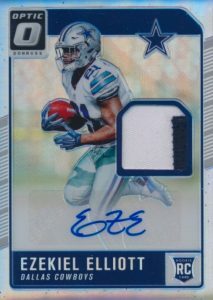 Combine that with a print run of just 75 copies and you have an Ezekiel Elliott rookie card that will stay high on the hobby radar. Better than a sticker, 2016 Infinity brings a trapped autograph that is actually signed on metal. This along with a more moderate print run makes it appealing for collectors on the hunt for something a little different but who don't have the budget for his very premium rookies. 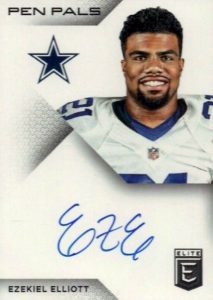 Also a redemption, this 2016 Panini Limited card for Zeke has a solid design and, most importantly, an on-card signature. 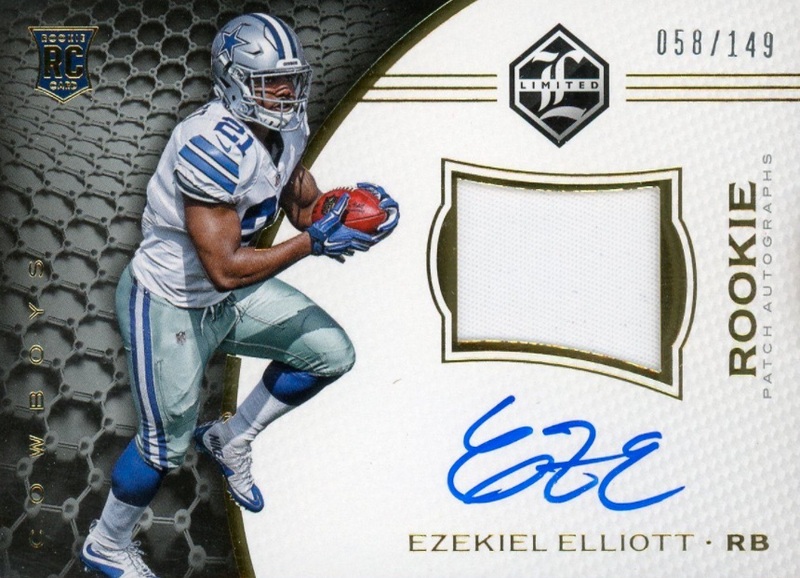 This makes it much easier to overlook the all-white jersey piece relics that occasionally appear despite the set being named Rookie Patch Autographs. 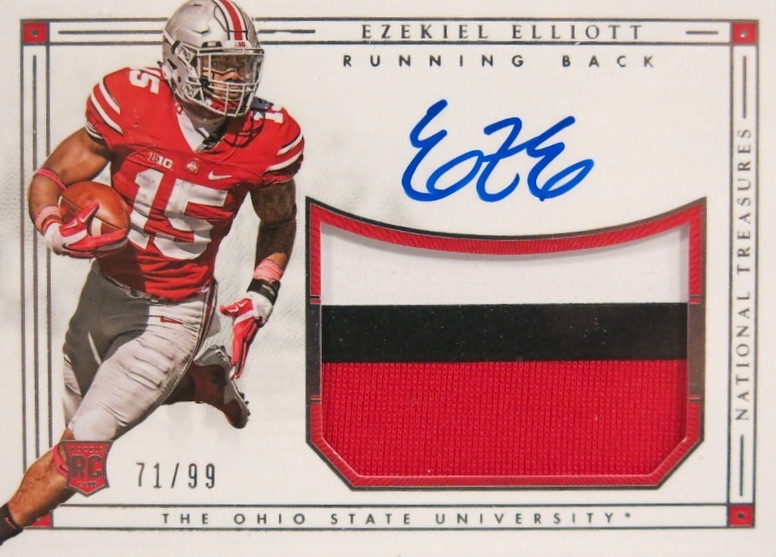 Part of yet another high-end NCAA set, 2016 NT Collegiate actually has several versions of signed patch cards for Elliott, each numbered to 99. 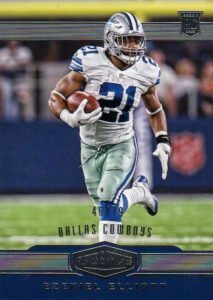 The card to beat among Ezekiel Elliott rookies, 2016 National Treasures has long been a collecting favorite for those who can afford it. Buoyed by the NT brand name, low print run, massive swatch and hard-signed autograph, these go for four figures. An early release featuring an on-card signature, 2016 Panini Origins benefits from a similar look to Topps Inception. While some of the rookies in the set carry the dreaded #00 jersey, Elliott is treated to his actual jersey number, further enhancing the interest. Another sticker autograph and relic option, the 2016 Phoenix rookie for Elliott is extremely short printed. 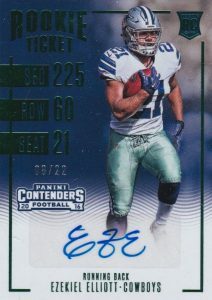 While most rookies are numbered to 249 or 99, Elliott only has 49 base cards. 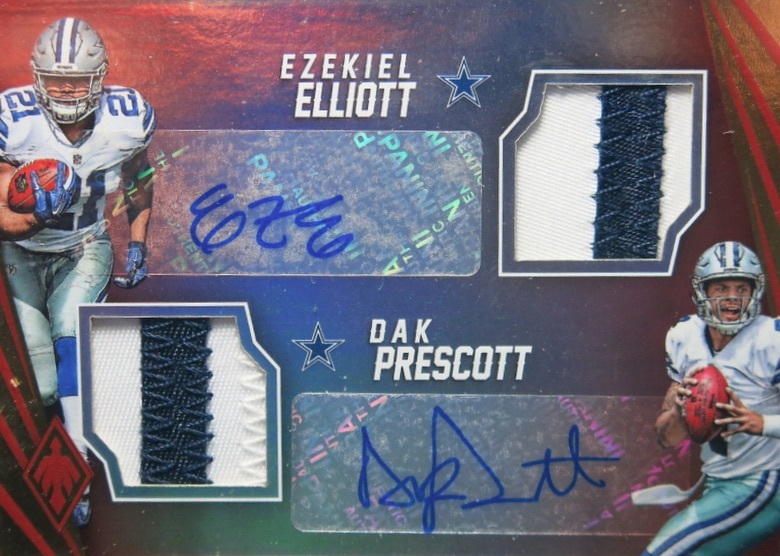 Also worth noting, the limited insert below puts autographs and relics for both Dak Prescott and Ezekiel Elliott on the same card. 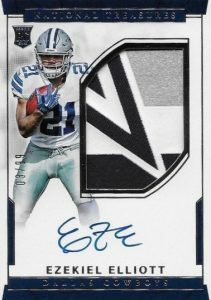 While not overly remarkable, Elliott's 2016 Plates and Patches rookie is one of his most limited base cards without any premium element added. 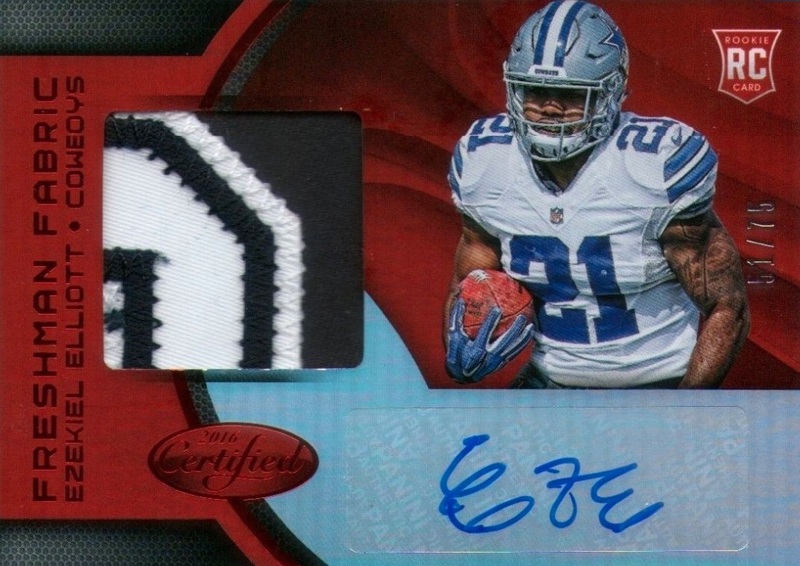 He also has a Rookie Patch Autograph that was inserted as a redemption. 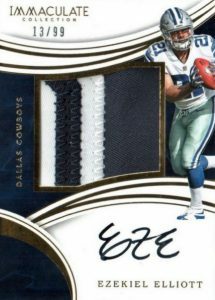 While not likely to wow traditionalists, the multi-layered and boxed card in 2016 Panini Playbook brings a lot in one Ezekiel Elliott rookie. Although the display factor is one area where cards normally fall short, this booklet stands apart with many compartments and a larger size. Basically the appetizer for the famed Contenders Tickets, 2016 Playoff offers a very limited preview version, numbered to 22 copies, that will remain very valuable even with the sticker autograph. Using the popular Silhouettes line to enhance the appeal, 2016 Preferred gives collectors a jumbo jersey piece with their on-card signature. 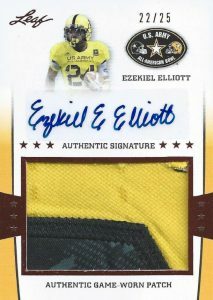 Zeke also has other autographs in the main set with different designs and lower print runs. While it does boil down to personal preference, there are a ton of inexpensive base options for the rookies each year. A top choice is the main 2016 Prizm brand both because of its Chrome-like qualities and accessibility. 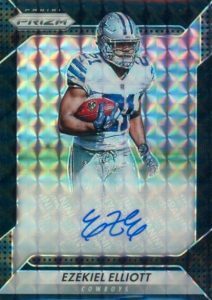 Plus, there are the many Prizm parallels to chase and adventurous collectors can attempt the Ezekiel Elliott rainbow. 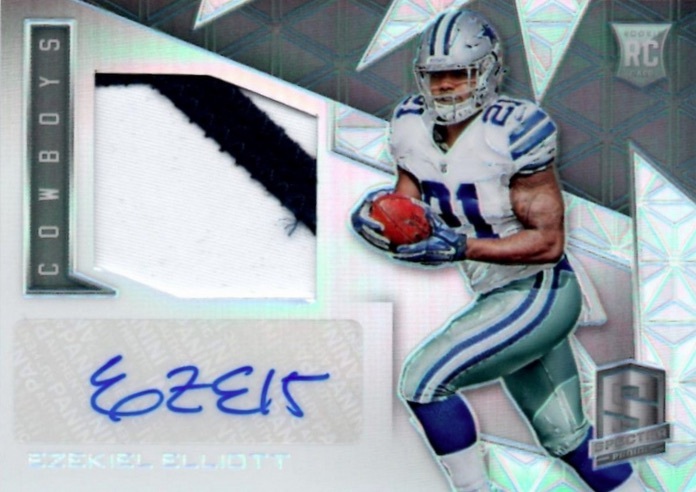 Prizm has signed cards for Elliott, as well, but most were issued as redemptions. Easily one of the wildest products as far as colors used, 2016 Panini Spectra heavily relies on neon inks and backgrounds. The primary version, limited to 99, is downright tame in comparison to the more limited Orange, Green, Blue, and Pink editions. He also has a standard base card in the set that is numbered to 99. Originally a redemption, Unparalleled matches Spectra in basic layout and rarity but without the crazy ink colors. 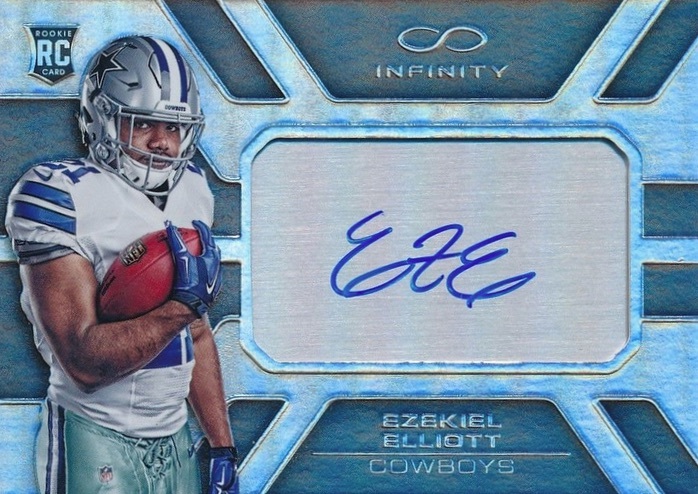 Among several signed options in 2016 Leaf football products, these Ezekiel Elliott autographs generally check in a little cheaper than his hard-signed, licensed cards, but still offer quality designs. 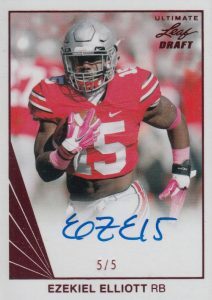 Coming well before his official rookie cards in 2016, collectors must look to 2013 for the earliest Ezekiel Elliott autographs. 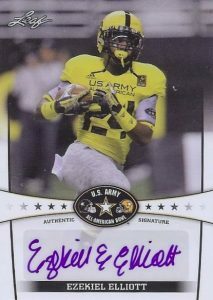 Part of Leaf's set for the U.S. Army All-American Bowl, standard autographs along with auto-patch cards are an option. 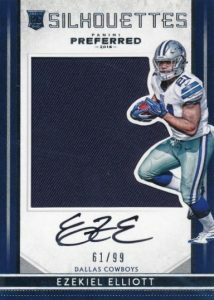 Most intriguing is the full-length signature on display that has now been replaced by initials ("EZE" or "EZE15") on most of his 2016 cards. 2016 Panini Gala Ezekiel Elliott Silver Screen 66 99 Great Card!!! 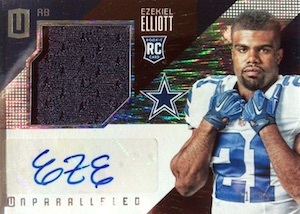 Ezekiel Elliott 2016 Prizm Coll. Draft #105 REF Prizm Gem Mint RC Rookie ! 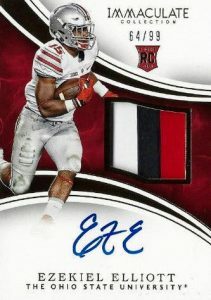 2016 Panini Honors Red Ezekiel Elliott Cowboys Rookie Auto 08 75 Great Card!! !